We left Salinas early for a hard 4 hour drive through winding coastal hills/mountains in rainy conditions. Attractive grazing country with a few oil fields. Drove into the massive irrigation area of the San Joaquin Valley. This valley irrigates an incredible 4 million hectares which is hard to compare against the Riverland which is about 30,000ha. Dairy is really big with large areas under lucerne and cereals for silage. Also beef cattle and some sheep. Lots of stonefruit and nut crops, some grapevines but they are really big on tomatoes. Water is supplied mostly from the snow melt. There is also some groundwater extraction. 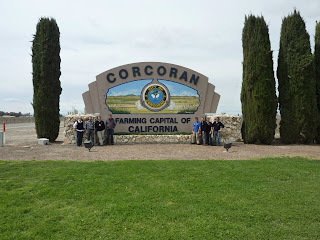 We met with the Rabobank manager to get an insight into grower financials, risk factors and opportunities in the valley. Land values are generally $13,000 - $15,000 US per acre (not hectare). We were then hosted by the manager of the JG Boswell Company of Corcoran. This is the largest family owned irrigation farm in the world with approx 40,000ha. They grow about 200,000 bales of cotton (500 pound bales) per annum. This photo shows some of the cotton harvesters. JG Boswell also produce amazing quantities of tomatos - approx 110,000 truckloads p.a. These are mostly value-added in their own massive tomato paste processing plant, producing approx 200 million pounds of tomato paste - making them a significant player in world paste production. This company also presses cotton seed for oil, grows hard wheat and Safflower. They also have major cotton growing interests in New South Wales, Australia. This photo is of a water harvester which can pump 7500 gallons per minute. We drove around their irrigated areas and its absolutely massive. Paddocks are being prepared for planting new tomato plants and are irrigated by sub-surface dripline. The scale is massive by any stndards and approx 60% of the nearby town of Corcoran is employed at the farm. Very impressive. Headed to a motel in Fresno for the night.